Original interview to Jordi Griera in USA Today. Joan Bardina Studies Center. 1. 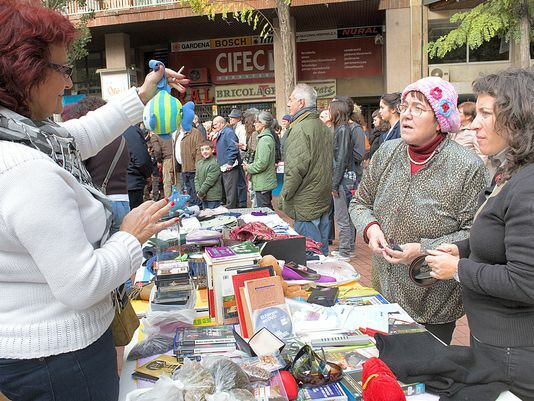 In addition to helping people without resources to access services and to obtain goods without spending money, what other function has the alternative economy within Spanish society? JGR – We are seeing that the most powerful effect of alternative economy networks is the brotherhood that develops among people who use them. It is as if what some call «traditional economy» contains certain mechanisms that prevent or hinder the development of human values, the expression of the desire for mutual assistance that we all naturally have. In the alternative economy the urge to help others flourishes and one sees altruistic behaviours that go far beyond what was originally intended, confirming that people are actually a far cry from the selfish and consumerist zombies described by the old economy. 2. The rise of alternative economies in recent years (social currencies, time banks, chain favors, collaborative consumption, etc. ), is solely due to the length and depth of the crisis in Spain? JGR – I think no one can doubt that the crisis has been the perfect catalyst for a deeper process. If one were to assume that people are mindless beings solely responding to the requests of their material needs, then one might think that the alternative economy is a mere reaction to the crisis, but if you accept that people have brains and heart, then you can easily imagine that the evolution of society in the past 20 years has caused many to wonder: «this consumer society of individuals in fierce competition with each other, buying on credit, is this what I want for my children?», to which the heart has responded with a resounding NO. Personally I think that the turn of the century has also favoured those questions, whose answers are the New Economics. 3. Is the culture of ownership and property changing in Spain? A few years ago it seemed that people were ashamed to buy second hand or to share items. Is that change due only to the need caused by the crisis or a change in mentality is taking place? JGR – Surely the answer to this question is contained in the previous one. Your observation is not superficial and I congratulate you for it. It is true that there is a decrease of what you might call people's attachment to objects, which lose part of the importance people used to grant them. It's as if the detachment advocated by many religions were taking root in society, the moment it decides to look at life from a viewpoint which differs from the one of the old economy. 4. Do you think the new economics can become an alternative to the dominant economic model? Is it a reaction to the hyper-consumerism of recent years? JGR – I think it could happen, but that substitution is not its main purpose. We call Economics the way people meet their needs for goods and services in order to live a decent life. Those needs include "proximity" goods and services such as food, personal care and a host of tailor-made items, which are the natural environment of the local economy, while there are other products whose manufacture requires large capitals and long production runs, whose scope is the global economy. So we should not be talking about alternative economy and traditional economy as opposed systems, but of local and global economies, each perfectly adapted to their environment and working together for the greatest happiness of citizens. 5. The Turuta in Vilanova is one of the most successful social currencies in Catalonia (I do not know if also in Spain). What is the key to its success? JGR – It is probably due to a combination of factors, among which I would highlight the following: First, the adoption of the transition cities model, that is non-political in nature and tries to ensure the supply of the first needs in the case of an energy crisis, such as the one that is looming on us. This means that the end of cheap oil is bound to make transportation more expensive, to the point that it might enthrone the local economy as we understand it. Secondly, the humility and wisdom of the promoting team; they know that no one can do anything if people do not want it, so the first thing they have done is to listen a lot and to correct a lot. Finally, I attribute the modest success of this project to its roots in the local society and in the values of the village, so citizens and traders are beginning to feel that the Turuta is theirs. 6. Some economists believe that social currencies hurt the traditional economy, especially the small shops, and that they constitute a sort of black economy. Do you agree? JGR – That consideration seems to stem from ignorance, and perhaps represents an a priori stance by that economist, who may have forgotten the scientific approach to first analyze reality and only then to build opinion on the observed results. Reality flatly contradicts such assertion, in Vilanova small traders are joining the system with enthusiasm because they have realized that their sales increase when customers need less euros to buy, as they are able to pay part of the price in local currency. Underground economy? not at all! Every transaction's taxes are paid in euros, thus state revenues increase thanks to the existence of the social currency. Surely it is because of this that no government seems worried by so many complementary currencies as are appearing in Europe. I also know several renowned economists, whose fame attests their intelligence and their openness; they do understand the rationale and the benefits of the new dual system: local/global economy and social/government currency. This new economy is here to stay because people find that that's what they want. I have no doubt that smart politicians will support it, because it benefits many without harming anyone. Books, toys, movies and video games for sale at this bartering market in Barcelona, Catalonia. (Photo: Xavier Sule).